What is “Exfoliating is The Secret to Glowing Skin” by Joanna Vargas? What are the most important aspects regarding the formula? What’s to remember when using it? What are our favs about it? What we don’t like at all? What’s last thing to mention? Even though one could get bored or simply tired of all the steps you need to take for a better and younger looking skin, having and respecting a good skin care routine is fundamental for keeping your skin nicer and better looking for years to come. Exfoliation is important only if you want to make the serum or your anti-aging moisturizer actually work. After all, no serum or face cream is able to go deeply and work from within your skin if it cannot penetrate deeply. And, for getting there, a good facial mask to use from time to time is essential. 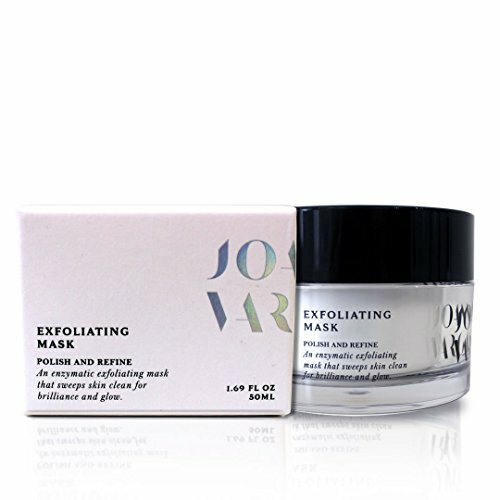 You only need to use the Joanna Vargas Exfoliation Mask only twice for a flash facial. The mask reduces and eliminates the damaged, dull and dead skin. It’s an easy and quick way to get your skin refreshed and healthier. The mask is able to eliminate the impurities, evening your skin tone. Exfoliating is an important step into getting healthier and prettier looking skin and you can’t skip it if you want to have a healthy skin. The multitasking facial scrub by Joanna Vargas is also an enzyme peel that gently removes dullness from skin, clearing pores and boosting the cell turnover. It makes your skin look younger and more radiant too. It refreshes your skin complexion and its formula is strong, while gentle on skin. The formula of the mask is well thought out and it’s based on volcanic ash that attracts excess oils and toxins from your skin, without drying your skin. The fruit enzymes within the formula unglue the dead skin and removes them, whereas the fine grains soften your complexion, increasing the healthy glow on skin. Lactic acid-brightens the skin and makes it softer. It makes the fine lines and wrinkles less visible and evens your skin tone. It helps your skin look better and smooths out acne scars and pigmentation. It controls oiliness in skin and keeps the risk for breakouts minimal. It boosts the collagen production in skin too. Galactoarabinan- this is a polysaccharide that is found in larch trees. It improves the skin cell renewal and minimizes the appearance of fine lines and wrinkles. It tightens the skin and lowers the trans epidermal water loss. It protects the skin from sun’s damage as it disperses the UV filters. Sodium hyaluronate-is an efficient moisturizer that binds and holds onto impressive amounts of water. It mimics the hyaluronic acid that is naturally produced by the body and doesn’t irritate the skin. It’s well tolerated by the sensitive skin too. Kaolin clay-it eliminates the impurities from skin and absorbs the excess oils in skin. It balances the oil production in skin and exfoliates it efficiently. It tones the skin and increases its firmness. It’s important for detoxifying and cleansing the skin. It’s efficient, yet gentle enough to work on all skin types, not only the sensitive type. Sugar cane extract-is loaded with zinc, potassium, magnesium, iron and anti-oxidants, fighting efficiently against aging of skin. It’s also loaded with phytonutrients that reverse the sun damage to the skin. It addresses acne and works, without drying out your skin. Orange fruit extract- calms the skin and keeps the bad UVs away from your skin. It’s moisturizes the skin too. Sugar maple extract-works as a natural alpha hydroxyl acid that minimizes and repairs the cell damage brought by the free radicals. Your skin has to be cleansed when using the mask. You only need to apply a thin layer to the skin. Use upward strokes for gently massaging it for 1 minute or so. Allow the mask to work for 5 minutes. When time is done, rinse it well with some tepid water. Most skin types are going to need the use of mask only twice a week. The mask isn’t over stimulating and is quite gentle. It has a delicious smell and doesn’t feel heavy on skin. It has a mild texture and hydrates the skin. You can use the mask easy and fast, improving the penetration of the skin serum and moisturizer. Removing dead cells from skin, the mask is uplifting and brightens the skin. The mask is made with natural and efficient ingredients that remove impurities from your skin, only to reveal healthier and younger skin. You shouldn’t skip it when in need, for sure. Recent reviews on Sugar & Fluff Beauty: the Brickell Men’s Advanced Anti-Aging Routine, the Strivectin-TL Tightening Face Serum Review, the Elemis Dynamic Resurfacing Skin Care System Review.